Our jazz guitar faculty focuses on developing your maximum musical potential and confidence by strengthening and fostering creativity, self-expression, and discipline so that you have the skills necessary to generate your own musical identity. Our curriculum focuses on proficiency in jazz theory, sight-reading, improvisation, chordal harmony and rhythm techniques, jazz and commercial repertoire, and ensemble work. 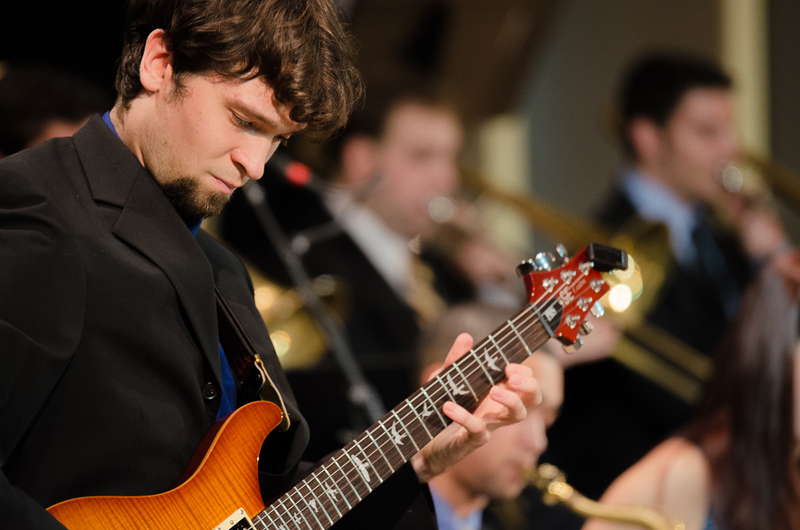 No matter what your applied instrument is - jazz guitar or electric bass - you can enroll in any of our degree programs, giving you the ability to focus on any professional musical career, while still learning the skills necessary to be a successful performer. We also enhance your educational experience throughout the academic year by providing opportunities for performance, both on student and professional levels. Student ensemble concerts, small group concerts, and even local jam sessions are all available to our students. In addition, you will have the opportunity to work directly with industry professionals in clinics featuring a variety of visiting artists. Students have had opportunities to study in master classes and clinics with guest guitarists and bassists such as Pat Martino, Mike Stern, Pat Metheny, John Scofield, John Stowell, Carl Verheyen, Jimmy Bruno, Derek Trucks, Marcus Miller, Gerald Veasley, and many more. To see a more comprehensive list of visiting artists who have offered clinics in the past, click here. By building these musical foundations, you will become a versatile, well-rounded professional who possesses the relevant job skills sought by today's diverse music industry.